This tutorial covers the basics of setting up Asterisk (TM), the popular Open Source PBX system from Digium, to provide call center queue functionality. It's designed to be of wide appeal to all Asterisk users - so only the last section is specific to OrderlyQ. 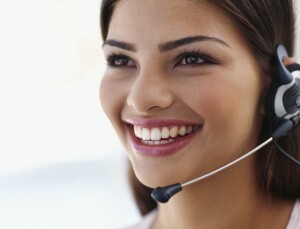 Once you've set up your queues and started taking calls, you should also take a look at OrderlyQ, which is an add-on for standard Asterisk queues that allows your Callers to hang up and call back later without losing their place in the queue, resulting in substantial increases in Caller satisfaction and retention, and substantial savings for Call Center operators. There is a FREE TRIAL of OrderlyQ now available for Asterisk users - please contact us for further details, or Try It Now by calling +44 333 5432 101. New: Try our new FREE statistics package for Asterisk, OrderlyStats. The best place for further information about Asterisk and VoIP in general is voip-info.org. First, you have a decision to make. The simplest Asterisk queue set up is where you add your phones directly to the queue. This is ideal if each agent has his/her own desk, with their own dedicated phone that no-one else uses. You will need OrderlyStats to do Hot-Desking if you are using the Phones method of call distribution. Also known as Local Channels. In this model, Asterisk calls extensions in your dialplan, which are then routed to your agent's phones. This allows your agents to log in and out of different phones, so is ideal if two agents need to share the same phone, or if your agents move desks (hotdesking). This allows for the most versatile call center. OrderlyStats can also make Hot-Desking easier when used with Local Channels. Agent Channels provide similar hotdesking functionality as Extensions above, and are simpler to set up, but have been deprecated and are not supported in Asterisk versions 1.6.2 and above, so will not be discussed further here. We've produced different versions of this tutorial to cover the different ways of setting up Asterisk queues. This version is the Phones version. You can switch to the Extensions method by clicking on the link above. Not sure which method is right for you? Though it's possible to use all three methods for different agents in the same queue, most call centers pick one method and stick with it. If you're new to Asterisk, or just want things to be easy and simple, start with the Phones method (described in full below). You can always move to a different distribution system later if you need to, and OrderlyStats can help you with simple hot-desking. If you need more complex Hot-desking, we recommend the Extensions method as this allows for a more versatile call center. If you're having any trouble setting up Asterisk queues, then please do ask us - even if you're not an OrderlyQ customer, we're always happy to help. There are a number of things you'll need to get set up. If you're starting from scratch, you might try an all-in-one distribution of Asterisk like Elastix or FreePBX. These include a precomplied Asterisk as well as an operating system for your hardware. It's more likely that you are installing Asterisk on an existing system. Though there may be pre-compiled Asterisk packages available, we find it's best to compile Asterisk from source, as this tends to give the best performance in our experience. First of all, you'll need a computer running Linux. We run Debian, but any Linux will do. Next you'll need to get Asterisk. We recommend you download the latest certified release. This tutorial is tested on 1.2.x, 1.4.x, 1.6.x, 1.8.x, 11.x and 13.x. You probably only need the basic Asterisk package, but the Addons and Sounds packages are also common choices. This will get you all the build dependencies and should prevent any compilation issues when you compile from source. OrderlyStats will show you what's going on as you set up your queues and route the calls through to the Agents. You'll also need OrderlyStats to follow the screen shots in the tutorial, and perform one-click Agent log in and log out. You can either download and install it yourself, or sign up for the Managed Service. Note: You can complete this tutorial without using OrderlyStats - but the resulting system will not be as good. Note: If you already have queues and Agents set up on your Asterisk, these will be detected automatically when OrderlyStats connects to it for the first time. Note: OrderlyStats will work with any Asterisk queue configuration, including Elastix, AsteriskNOW, TrixBox and FreePBX - you don't have to follow the set-up described in this tutorial to use OrderlyStats. This is optional - you will need it if you wish to use your own prompts to play to callers while they are in the queue. Asterisk does come with its own set of default prompts you can use for this purpse, so you can skip this section. If you're using other flavours of Linux, you may be able to find a pre-built package, otherwise you can download and compile the source code. If you're interested in creating your own telephony applications then you might also take a look at OrderlyCalls. In this tutorial we'll be using Sox to help us with Music On Hold. This is also optional - you will need it if you wish to play your own music on hold (that you have in MP3 format) that people will listen to while they are in your queue. Asterisk does come with its own set of music on hold you can use for this purpse, so you can skip this section. Typically music on hold is provided through MP3 files, which is one of the few formats not supported by Sox. Lame is an MP3 encoder/decoder which we can use for conversion. If your installation is successful, then typing lame at the command line should print out usage information. That's it for the prerequisites. Once you've got Asterisk, you'll need at least two phones in order to test your phone system. In this tutorial we're going to use three - but don't worry - instead of buying hardware phones, we're going to use free SIP software phones instead, running on another computer on the local network. We use SJPhone from SJLabs (installation instructions), and X-Lite from CounterPath (installation instructions), and Express Talk from NCH (installation instructions), all running on the same Windows PC. You can use the FREE versions of all these phones to complete the tutorial. We also use MicroSIP and Vop Nano if we need even more phones. 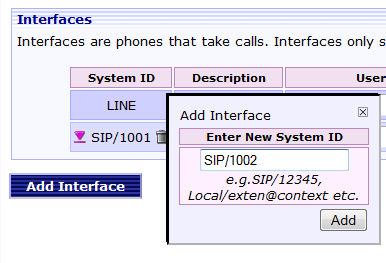 If you are using your own sip.conf entries, you must make sure the Callerid and context are set as above to be able to follow the examples in this tutorial. Hint: If you want to hear Music On Hold with X-Lite, make sure Menu->Advanced System Settings->Audio Settings->Silence Settings->Transmit Silence is set to Yes. Note: We couldn't get DTMF (keypress) tones from the current version of SJPhone to work at all, so we'll use this as the Caller's phone for the rest of the tutorial. We'll use Express Talk (1001) as the first Agent phone, and X-Lite (1002) as the second. The username and password fields are for the Agent Toolbar - more about this later. Note: The LINE Agent is automatically created by the system, and is used to indicate that a call has been answered, but not by an Agent. Next, we need to create extensions for your phones, so that Asterisk can dial them. > asterisk -rx "core restart now"
Note: You must restart asterisk for this change to take effect. Next do an Asterisk reload by typing module reload (or just reload for Asterisk 1.4 or below) at the Asterisk command line (which you can reach by typing asterisk -vvvr). Here we have created a new context for your phone calls, called main. Calls made from your phones will arrive in the context specified in each phone's sip.conf entry (which we have already set to main). We've also defined a pattern-matching extension, which will match any four digit number 1000 to 1999. The extension dials the corresponding SIP phone. Let's make some calls! To recap, we have set up agent John Doe using phone 1001 (ExpressTalk), and agent Jane Smith using phone 1002 (X-Lite). We're using SJ-Phone to represent your callers. John's phone Ringing with the inbound call from SJPhone / 1003. After answer, John is shown as Talking to Caller 1003. Now we're going to test the second Agent, Jane Smith (1002), using X-Lite. John (1001) makes an internal call to Jane (1002). John misses an inbound call, makes an outbound call, calls Jane but she doesn't answer, and then calls Jane and she does answer. Calls are shown with the most recent at the top of the page (but you can change the sort order using the arrows at the top of each column). When callers call Asterisk, you can play them music. Although Asterisk can play MP3 files, this is very inefficient as the file must be continually decompressed by the processor as it is played for each caller. It is better to use wav or alaw files, as these place less load on the system when played. You can play a single file or groups of files; in the latter case Asterisk will play each file in order, then repeat (assuming your caller is still on hold by that point). To specify groups of files, you put them in the same directory. To play a single file you create a directory and put the single file in it. You can also specify multiple different groups of files to play under different circumstances. This directory contains three sound files in wav format. To begin with, all the other classes are commented out. We'll start by testing the default configuration. Add the following lines to /etc/asterisk/extensions.conf, inside a context you can reach with your phones. Next do an Asterisk reload to tell Asterisk about the new extension. Now dial extension 2000 with your phone. You should hear the default music. Note: If you hang up and call back, the music starts where it left off, not at the beginning. This is an efficiency measure in Asterisk, as it's much less computationally expensive to produce one music stream shared between all callers, rather than a separate stream for each new call. You'll probably want to change the music played to suit your own tastes, so find an MP3 of some music you'd like to play to your callers. A good source of free classical MP3s is classiccat.net. You may need to remove the other files that are there and restart asterisk in order to hear it played. ;Play my new music class, instead of the default. Note: Remember to restart Asterisk if you've made any changes to your music on hold system. Now you've defined your Agents and their phones, you're ready to set up a queue. Queue definitions are found in /etc/asterisk/queues.conf. As you'll see there are a lot of configuration options; here are two example queues to get you started. These queues will ring all assigned Agents when a new Caller arrives, and will not make any announcements regarding queue size, estimated wait etc. If you've defined a custom music class, you can set your queue to use it with the music parameter. Static Agents' phones are rung all the time, regardless of whether the Agent is present to answer, so you will have a room full of ringing phones all the time. These drawbacks are removed by using dynamic Agents instead as described in the next section. Hint: You can use Group functionality to assign groups of Agents to queues, but many of our users have had problems with this system, so we don't recommend it. It's much better to add Agents individually to each queue. Hint: If you have already set up your Asterisk queues, you should remove any 'member =>' lines from your queues.conf, otherwise your agents won't be able to dynamically log in and out of your queues. You can manage agent assignment in the OrderlyStats Agents page. To recap, so far we have defined our Agents and the phones they use. We have also defined two queues, so the last thing we need to do is create the mechanism that allows Agents to log in and out of the queues, so they can start receiving queued calls. Skip to The Easy Way if you're using OrderlyStats. There is no support for wrap-up (using the Pause system). Although the Agents are now assigned, they won't start taking calls until you log them in with the Login button ( ), which you can do from this page as Call Center Manager. 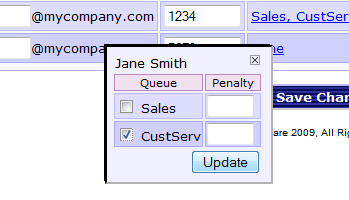 Jane's Agent Toolbar showing an answered INBOUND call. To Log Out of all her queues, Jane just needs to hit the Log Out button. She can log in to all her assigned queues with one touch by hitting the Log In button. If your Agents need time to wrap up after each call before taking the next call, they can do this by hitting the Pause button during the call, or aftwerwards. This will prevent the queue(s) to which they are assigned from sending them more calls until they hit the Resume button. The OrderlyStats Reports will show you Agent session times, and also time spent in wrap up after each call. Note: The Toolbar Login/Logout function logs an Agent in or out of all the queues to which the Agent is assigned in the Agents page. 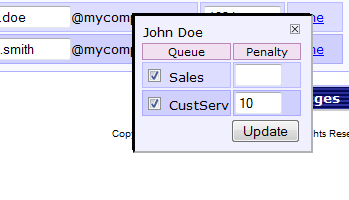 Agents do not have direct control over which queues they are assigned to with the Agent Toolbar. This is by design. As Call Center Manager, you can do this yourself at any time using the Agents page to reassign Agents on the fly, or log them in and out yourself using the Log In/Log Out buttons next to each Agent in the Control Panel. You retain full control of which queue(s) each Agent is assigned to. The last step is to provide an extension for incoming Callers to ring into the queue. Add the following lines to /etc/asterisk/extensions.conf at the end of the [main] context. Next do an Asterisk reload. To test your queue, use SJPhone (1003) to dial extension 3001 (CustServ). You should hear music on hold through SJPhone, and the other phones will start ringing. A queued call in the CustServ queue. Jane's phone is ringing, but John is currently Paused, so no calls are placed to him. Note that if there are no Agents available, the Caller will hear music on hold indefinitely. Hint: If you want to change this behaviour, then add leavewhenempty=yes to the queue's entry in queues.conf, and replace the Hangup line in the above example with, for instance, a call to leave Voicemail instead. As of Asterisk 1.2.0, this is the default behaviour. Steps 1-7 will give you a call centre with a traditional ACD / on hold queue system. However, the traditional ACD as implemented in Asterisk is not optimised, so you will not be answering as many callers as you should when using an optimised queue. To answer all your callers, you will need our OrderlyQ add on, which guarantees you a > 99% answer rate, and at least a 300% return on investment. 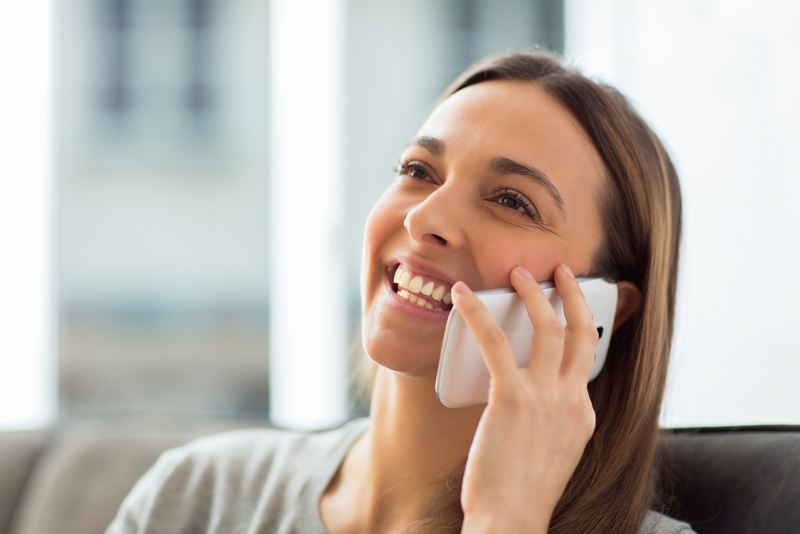 The OrderlyQ system also means that your callers will not have to wait on hold in order to get through, so you will see massive increases in caller satisfaction, as well as a major improvement to your business bottom line. To get started with OrderlyQ, just request a demo and we'll tell you all about it.